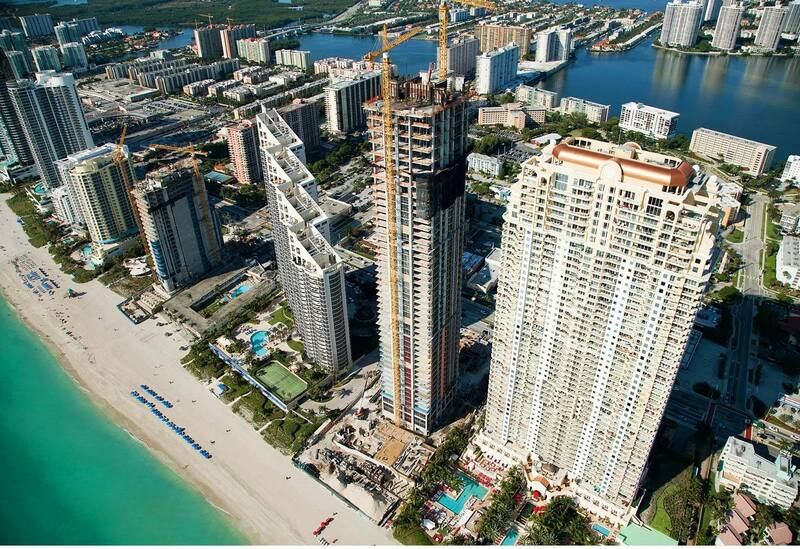 The newly finished Mansions at Acqualina, a beachside luxury residence in Sunny Isles Beach, Florida, counted on PENETRON ADMIX to provide a durable and waterproof foundation for the 46-floor tower construction. Morning slab work: PENETRON ADMIX provided a reliable waterproofing solution for hydrostatic resistance of the matt slab on grade and perimeter walls for the Mansions at Acqualina foundation. PENETRON ADMIX was specified to provide better protection from saltwater for the hydrostatic matt foundation than any conventional system. Adjacent to the Acqualina Resort & Spa, another PENETRON-enhanced luxury residence, the new Mansions of Acqualina are a high-level luxury residential project with 79 units, all with unobstructed 270° views. The smallest residential unit is 4,600 square feet/1,400m2, and the largest is a two-story penthouse on the top floors with 360° views from both floors. The centerpiece of the Mansions of Acqualina project is a 46-floor tower; at 643-feet/196m tall, it is Florida’s 5th tallest structure and currently the tallest in Sunny Isles. Construction on the final units was completed last month. The construction site, immediately fronting the Atlantic Ocean, demanded an absolutely reliable waterproofing solution for hydrostatic resistance of the below-ground structure. The concrete that was treated included all the below-grade structures, which consisted of the matt slab on grade and perimeter walls. After consulting with the project team at Trump and the contractor (Coastal Construction), PENETRON ADMIX SB in soluble bags was mixed into the matt slab and all below-grade walls. Approximately 2,500 cubic yards of concrete were treated. The crystalline technology of PENETRON ADMIX also provided secondary protection because the top of the matt foundation was also the finished floor of the parking structure. As the admixture is permanently integrated into the concrete, the slab and walls will continue to remain dry, should any moisture find its way into the building in the future. Outlook is excellent:The 46-floor Mansions at Acqualina (center tower with cranes) is Florida’s 5th tallest structure and rests on a PENETRON ADMIX-treated foundation.